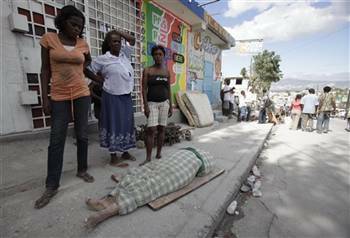 PORT-AU-PRINCE, Haiti – Death was everywhere Wednesday in this devastated city of 2 million. Bodies of tiny children were piled next to schools. Corpses of women lay on the street with stunned expressions frozen on their faces as flies began to gather. Bodies of men were covered with plastic tarps or cotton sheets. 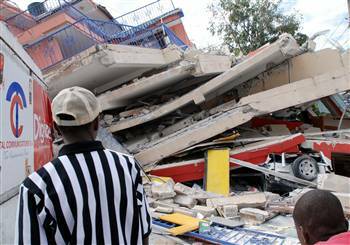 Moreover, untold numbers were still trapped after a powerful earthquake Tuesday crushed thousands of structures — from schools and shacks to the National Palace and the local U.N. headquarters. 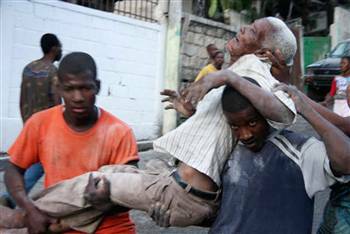 Soon after, however, Bellerive told CNN that “I believe we are well over 100,000” dead, while Haitian Sen. Youri Latortue said it could be 500,000. 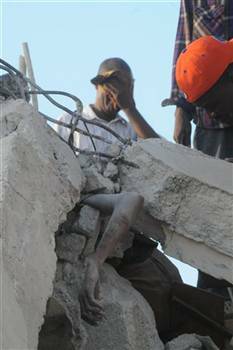 …Aid workers reported widespread destruction and suffering. …People pulled bodies from collapsed homes, covering them with sheets by the side of the road. 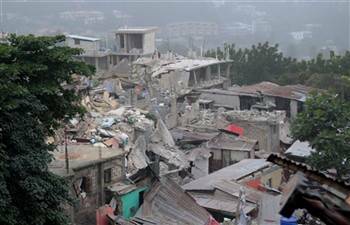 …Tens of thousands of people appear to have lost their homes and many perished in collapsed buildings that were flimsy and dangerous even under normal conditions. …U.N. peacekeepers were distracted from aid efforts by their own tragedy: Many spent the night hunting for survivors in the ruins of the local U.N. headquarters, where more than 100 people are missing. To see how you can help, visit the website of the Center for International Disaster Information.